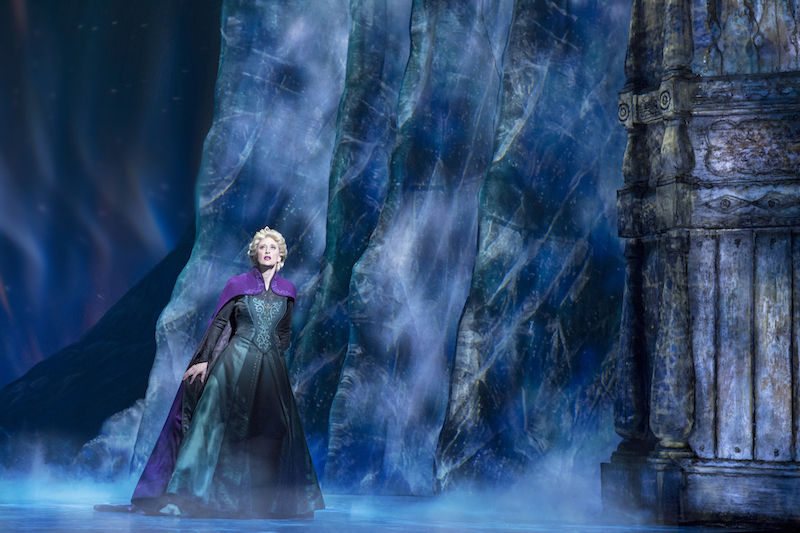 Disney has clearly spent a fortune on white hot property Frozen the Broadway Musical, and yet the new musical is lukewarm at best. While the massive success of recent Disney production Aladdin the Broadway Musical appears to have been a happy accident, the creative team working on Frozen the Broadway Musical seem to have tried too hard. 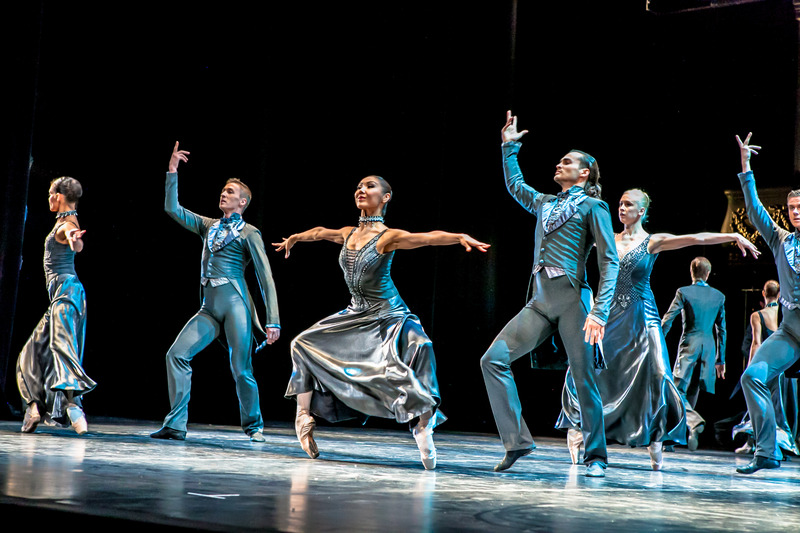 For all the epic scenery, icy projections, cute costumes and magic tricks, there are almost no wow or how-did-they-do-that moments on par with, say the stage musicals of Beauty and the Beast or Mary Poppins. More significantly, great slabs of Jennifer Lee’s book wallow in po-faced tedium, crushed under the weight of the characters’ solemn seriousness. Frisky cherub Young Anna (played with polished flair, at this performance, by Audrey Bennett) scores some early laughs, but when she promptly grows up, the laughs diminish. It seems against the rules of Disney stage adaptations for Olaf the snowman to be so identical to the movie character; this sort of pandering to audience expectations is usually reserved for character suits at the theme parks. To take nothing away from his excellent performance, Olaf puppeteer/portrayer Greg Hildreth even looks like Olaf’s movie voice artist, Josh Gad. 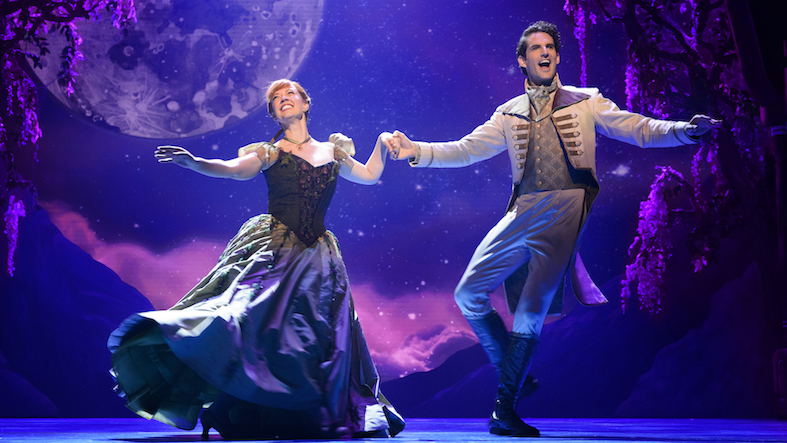 Composers Kristen Anderson-Lopez and Robert Lopez have worked closely with Lee to integrate the score throughout the scenes, but the result is a show with only a handful of distinct songs and not many opportunities for the lively audience to applaud. Movie charm songs “In Summer” and “Do You Want To Build A Snowman?” are winners, and “For The First Time In Forever” remains the most hummable take-away tune. Designer Christopher Oram makes endless use of the signature colours of purple and green. 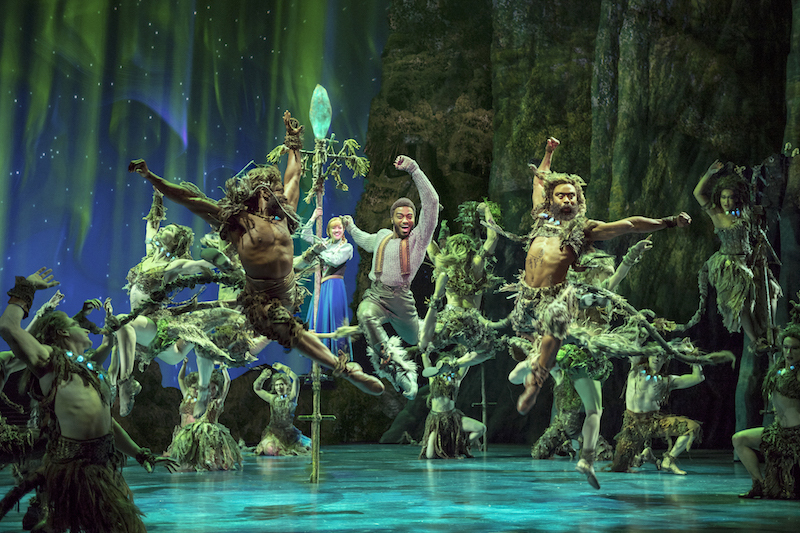 Aided by the St James Theatre’s recent stage extension, the ever-changing scenery is on a grand scale. Impressive as the solid scenery is in appearance, the video projections (by Finn Ross) are the ice-ing on the cake. Compared to the work of Tina Landau with hyperkinetic new musical SpongeBob SquarePants or the legendary work of Julie Taylor on The Lion King, respected director Michael Grandage may have been the wrong choice to guide this beloved animated movie to the stage. 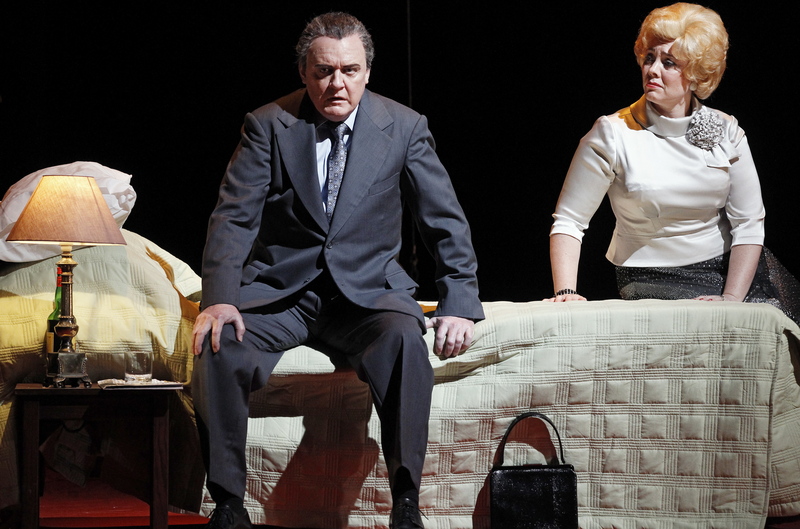 The musical follows the movie to the extent that there are no surprises, and characterisation is energetic but uninspired. 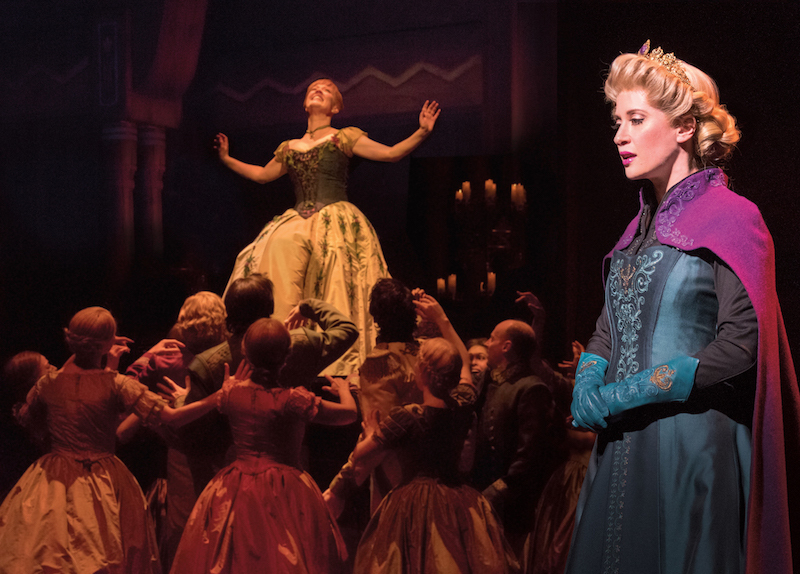 Through a combination of focus and magnetic presence, Caissie Levy is a pleasure to watch as Elsa. There is no doubt that Levy’s singing voice is more than capable of the strong belt required, and the she pulls off her showy numbers while calmly staying true to character. As lovingly gullible sweetheart Anna, Patty Murin creates a nice contrast to Levy’s portentous Elsa, enjoying resonant chemistry with each of her male co-stars. 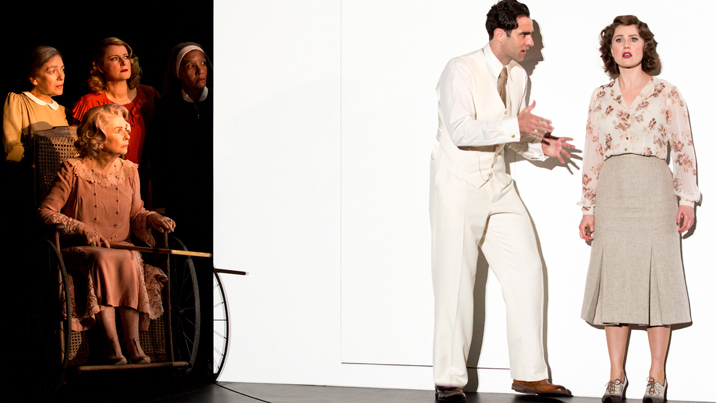 Looking every bit the Disney prince, John Riddle cuts a dashing presence as Anna’s suitor, Hans. In an odd directorial choice, Grandage has Riddle portray the young man in an oh so modern way, making the character feel like a ring-in from Dear Evan Hansen rather than a stately citizen of the Southern Isles. 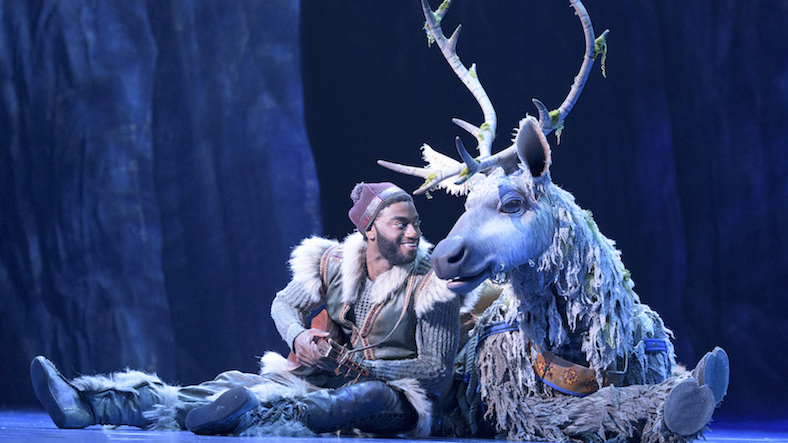 Jelani Alladin brings vivacious energy to the likeable role of Kristoff. Unseen actor Andrew Pirozzi does a sterling job as friendly reindeer Sven. It will be interesting to see whether Frozen matches the success of Aladdin and Beauty and the Beast or whether it fades away after Broadway like Tarzan and The Little Mermaid. There is no doubt that Frozen is far superior to last year’s lamentable non-event Charlie and the Chocolate Factory, but on Broadway it is currently outclassed by Anastasia and SpongeBob SquarePants. 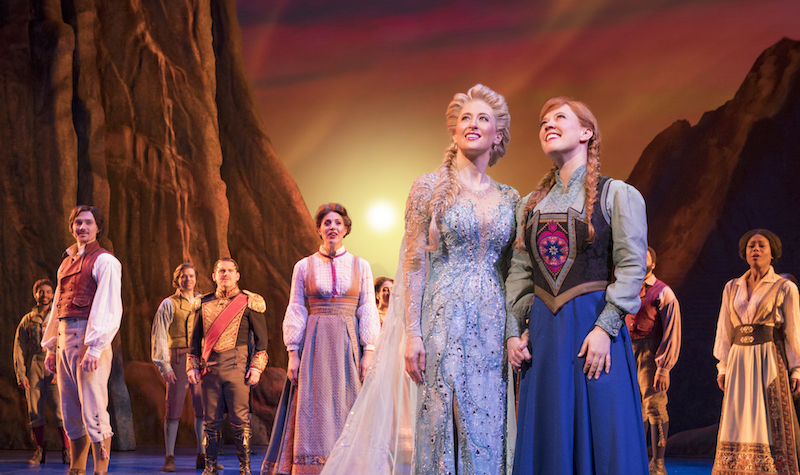 Frozen the Broadway Musical was reviewed 7pm Tuesday 10 April 2018 at St James Theatre, New York where it plays an open run. Footnote: When Arendelle is beset by endless winter, Kristoff complains that Oaken has raised prices in his store. Ironic, then, that some of the Frozen the Broadway Musical merchandise is 50% more expensive than similar items at other Broadway shows.